Welcome to PEIG.ie's job vacancy database. Below you will find information on new jobs and opportunities that involve the Irish language both here and abroad. This page is updated daily. You can place an advertisement free of charge by contacting peig@cnag.ie. You will find at the bottom of the page what format the job vacancy should have when sending it to PEIG. Description: Is sa Bhruiséil agus i Lucsamburg is mó a bheidh na conarthaí poist atá á dtairiscint faoin bpróiseas roghnúcháin seo/faoi na próisis roghnúcháin seo. Is féidir go mbeidh líon beag conarthaí le fáil i gcathracha eile san Aontas Eorpach agus i dtoscaireachtaí an Aontais Eorpaigh áiteanna eile ar domhan. Description: Is sa Bhruiséil agus i Lucsamburg is mó a bheidh na conarthaí poist atá á dtairiscint faoin bpróiseas roghnúcháin seo/faoi na próisis roghnúcháin seo. Description: Tá i gceist ag Lár Chomhairle Paróiste Ghleann Cholm Cille Oifigeach Forbartha a earcú le cuidiú le plean oibre don pharóiste a chur i gcrích agus tograí forbartha úra a aimsiú i gcomhar leis an coistí sin a mbeidh tionchar dearfach acu ar an cheantar / ar leas coiteann an phobail. Description: Post nua á thairiscint ag Tuismitheoirí na Gaeltachta. Description: Príomhoide nua ag teastáil ón gColáiste i mBaile Átha Cliath. Description: Ceannaire ag teastáil. NVQ Leibhéal 5, Gaeilge líofa riachtanach. Taithí ar obair i Naíscoil Ghaeilge inmhianaithe. Description: Is mian le Foras na Gaeilge, an comhlacht forfheidhmithe atá freagrach as an Ghaeilge a chur chun cinn ar fud oileán na hÉireann, an ceapachán seo a leanas a dhéanamh.l.. Description: Beidh an post seo lonnaithe in oifig Fhoras na Gaeilge i nGaoth Dobhair, Co.Dhún na nGall. Description: Ceapachán bliana, le féidearthacht go ndéanfaí buan é, 3 phointe bainistíochta (bheadh Gaelcholáiste Dhoire toilteanach seo a phlé bunaithe ar thuarastal reatha an iarratasóra). Description: D’fháilteodh Gaelcholáiste Dhoire go háirithe roimh iarratasóirí ar féidir leo na hábhair seo a leanas a theagasc: Béarla, Ceol, Ealaín, Eacnamaíocht Bhaile, Eolaíocht, Corpoideachas, Ríomhaireacht, Mata, Drámaíocht, Cúrsaí Leibhéal 2 Garimiúil/Acadúil, agus Teicneolaíocht. Description: Feictear ar líofacht sa Ghaeilge mar bhuntáiste don ról seo a bheidh lonnaithe i nGaillimh. Description: Caithfidh Gaeilge líofa a bheith ag an té a cheapfar agus a bheith in ann comhfhreagrais agus obair riaracháin a dhéanamh trí Ghaeilge. Description: Tá borradh agus fás faoi earnáil na Gaelscolaíochta i rith ama agus ba mhaith le Bord CnaG an dá phost nua tábhachtacha seo a cheapadh chun tacú leo, lena bhfís agus lena straitéis d’earnáil na Gaelscolaíochta a fhorbairt agus a chur i bhfeidhm. Description: Beidh an té a cheapfar freagrach as cur i bhfeidhm clár forbartha chun úsáid teicneolaíocht dhigiteach a chur chun cinn i measc gnóthaí beaga & meánacha. Description: Tá folúntais poist ag an BAI láithreach ag an leibhéal Ardoifigeach Feidhmiúcháin (AOF) - Conradh sealadach ar théarma seasta (2 bhliain). Description: Tá obair idir lámha faoi láthair chun ábhar tacaíochta a sholáthar don ábhar léitheoireachta atá i gcló cheana do Rang 3 – 6 mar chuid de thionscadal Shéideán Sí. Lena chois sin táthar ag iarraidh ábhar nua léitheoireachta a chur ar fáil do na ranganna céanna. Chuige sin tá scríbhneoirí á lorg a bheidh in ann úrscéalta ranga, go háirithe, a sholáthar ach chomh maith leis sin beidh gearrscéalta, filíocht, drámaí agus leabhair eolais de chineálacha éagsúla ag teastáil. Description: Tá post mar Oifigeach Turasóireachta, a mhairfidh suasle dhá bhliain á thairiscint ag Comhar Chuigéal Teoranta d’iarrthóirí a bhfuil líofacht sa nGaeilge acu. Description: Bainisú ar acmhainní digiteacha, ina measc, digi9ú, agus scanáil scannstoc ó chluichí craolta. Cuirfear traenáil ar fáil don té a cheapfar. Description: Tá Comhar Naíonraí na Gaeltachta ag lorg iarratais do phost mar Oibrí Iarscoile in Ionad Cúram Leanaí Ráth Chairn, Ráth Chairn, Baile Átha Buí, Co. na Mí. Description: Tá Comhar na nOileán CTR ag lorg duine atá spreagach agus cumasach le post a ghlacadh mar Phríomhoifigeach Feidhmiúcháin den Ghrúpa Forbartha Áitiúil Comhtháite do na hoileáin amach ón gcósta. Description: Beidh trascríbhneoirí á lorg a bheidh in ann obair ó chian. Description: Tacaíocht eagarthóireachta agus riaracháin a chur ar fáil d'fhoireann na dtionscadal ar na tionscadal taighde atá luaite. Beidh na daoine a cheapfar lonnaithe in oifigí Fiontar & Scoil na Gaeilge. Description: Ag freagairt don Ard-Stiúrthóir, beidh an Stiúrthóir Airgeadais agus Riaracháin i gceannas ar an bhfeidhm airgeadais i TG4 a phleanáil, a stiúradh agus a chomhordú chomh maith le riarachán ar oifig TG4 agus riarachán ar ghnó TG4. Beidh an duine a cheapfar freisin ina rúnaí comhlachta do Theilifís na Gaeilge. Description: Is foilsitheoir/craoltóir seirbhíse poiblí é TG4 a fhaigheann formhór a ábhair ón earnáil léiriúchán neamhspleách, ábhar a bhfuil duaiseanna agus gradaim go leor buaite aige. Faoi láthair tá TG4 ag earcú Stiúrthóir Oibríochtaí agus Acmhainní Daonna a bheidh mar bhall den fhoireann Ard-Bhainistíochta agus a bheidh lonnaithe sa Cheannáras i mBaile na hAbhann. Description: Tá Forbairt na Rosann CTR/Coiste Stiúrtha Pleanála Teanga an Chlocháin Léith ag lorg tairiscintí ó eagrais nó ó dhaoine aonair atá cáilithe i réimse na pleanála teanga le plean teanga a ullmhú don Chlochán Liath le go mbeidh ar a chumas aitheantas a bhaint amach mar Bhaile Seirbhíse Gaeltachta. Description: Beidh an post seo lonnaithe in oifig Fhoras na Gaeilge, Sráid Amiens, Baile Átha Cliath. Description: Tá Stiúrthóir á lorg Thaisce Cheol Dúchais Éireann i láthair na huaire. Description: Tá Criú á lorg ag Ros na Rún i láthair na huaire. Description: Tá feighlí leanaí ag teastáil le haire a thabhairt do triú pháiste álainn i Rath Garbh i mBaile Átha Cliath 6 go lánaimseartha ón Luan go dtí an Aoine. Táimid sásta tuarastal níos airde ná an gnáththuarastal feighlíochta leanaí a chur ar fáil ag braith ar taithí agus ar cháilíocht an té a éiríonn léi/leis an post a bhaint amach. Description: Tá Gaeilge ag teastáil más maith leat an ról seo a bhaint amach. Description: Tá Teagascóir LEGO Páirtaimseartha á lorg i ndeisceart Bhaile Átha Cliath. Description: Tá líofacht sa Ghaeilge ina bhuntáiste don ról seo. Description: Tá oibrí á lorg ag Four Provinces do theach tábhairne nua. Description: Tá Abtran sa tóir ar dhaoine oilite dá bhfoireann i gCorcaigh. Description: Tá Comhar Naíonraí na Gaeltachta ag lorg iarratais do phost mar Ionadaí i Naíonra Mhic Amhlaigh, Lána an Mhuilleora, Cnoc na Cathrach, Co na Gaillimhe. Description: Tá Teagascór Gaeilge á lorg ag an gclub sacair. Description: Tá Naíonraí Mológa Teo. 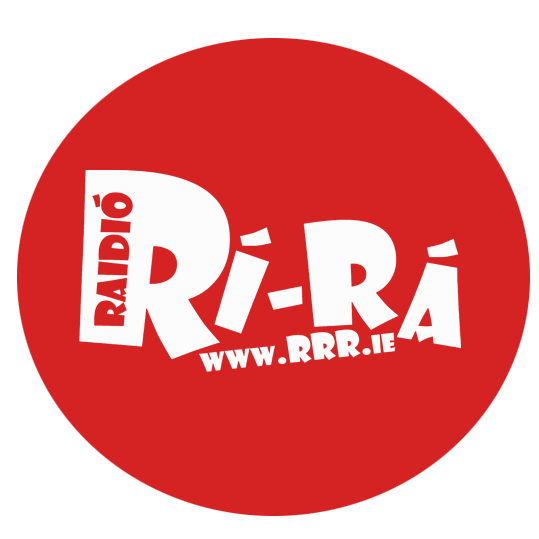 ar lorg Múinteoir Naíonra ar fad 8 go 10 seachtain, ag tosnú láithreach, más féidir. Caithfidh Fetac leibhéal 6 a bheith acu agus líofa sa Ghaeilge. More info Deirdre Ní Chuilinn, Naíonraí Mológa Teo. Description: Tá Ealaín (na Gaeltachta) Teo. ag cur painéal teagascóirí le chéile a mbeadh suim acu ranganna sna healaíona dúchasacha (ceol, damhsa, lúibíní agus agallamh beirte, amhránaíocht) a sholáthar trí mheán na Gaeilge, i nGaeltacht Chonamara agus Árann, idir Mí Eanáir 2019 agus Mí Meithimh 2019. Description: Tá post in FMI ar fail do Feidhmeannach Ionad Teagmhála cumasach agus spreagtha le bheith mar baill d’ár príomh-foireann i mBaile Átha Cliath. Description: Tá Ráidó Fáilte ag lorg craoltóirí nua faoi láthair. Téigh sa seans! Description: An bhfuil fonn tras-scríofa ort? Ar mhaith leat páirt a ghlacadh sa tionscadal ach níl tú cinnte cén áit is fearr le tosú? Lean na naisc thíos agus tabharfar scéal randamach ón mbailiúchán duit le tras-scríobh! Description: Tá Lionbridge sa tóir ar dhaoine le Béarla agus Gaeilge líofa le léirmheasanna a dhéanamh ar thorthaí cuardaigh idirlín. Description: Is é an sprioc atá le sealanna oiliúna Schuman ná cur le hoideachas agus gairmoiliúint shaoránaigh an Aontais agus deis a thabhairt dóibh léargas a fháil ar an obair a dhéantar i bParlaimint na hEorpa. Description: Tá STAR Translation Services sa tóir ar Shaoraistritheoirí Gaeilge i láthair na huauire ar mhaithe le roinnt cineálacha aistriúcháin a chur ar fáil. Description: Tá duine le Gaeilge líofa á lorg i láthair na huaire. Description: Tá aistritheoir á lorg ag STAR Translation Services ar mhaithe le tograí teicniúla aistriúcháin a dhéanamh. Description: Tá Cúntóir Cúraim Athlonnaithe á lorg ag Teacht Altranais Charna faoi láthair. Fáilte roimh Churamoirí a bhfuil Gaeilge ar a dtoil acu. Description: Tá Teagascóirí Gaeilge á lorg ag Hibernia College faoi láthair. Tá máistreacht ag teastáil don ról seo. Description: Tá painéal páirtaimseartha múinteoirí agus ceartaitheoirí ag Gaelchultúr agus bímid ag féachaint i gcónaí le cur leis an bpainéal sin. Má thagann aon obair mhúinteoireachta/cheartúcháin chun cinn a mheasaimid a bheadh oiriúnach duit, rachaimid i dteagmháil leat chun agallamh a shocrú. Description: Tá folúntais sa stáisiún do láithreoirí & tuairisceoirí deonacha ar chláir éagsúla i rith an tsamhraidh. Bain triail as rud éigin nua, agus as an stiúideonua atá againn ar Shráid Amiens! Beidh oiliúint ar fáil, déan teagmháil linn! We have no problem advertising the job vacancy both her and through our various social media pages, so that employers may receive as much advertisement as possible. We recommend that the job description comes in PDF format, or that a link to a website containing the information be provided. Make sure a deadline date is also given. How to get an Irish language job. Foras na Gaeilge and GradIreland have published a comprehensive handbook titled "Do Ghairm le Gaeilge". Learn how to put a CV together in Irish or read about the various job opportunities available in which having the Irish language is an advantage. You can find that here. 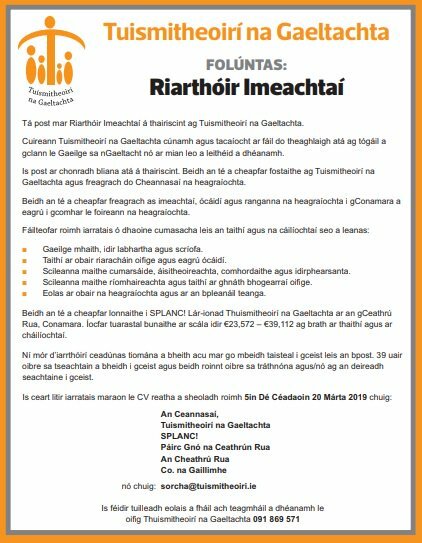 We welcome any member of the public to send us information on Irish language job vacancies that we should know about.